6He is not here; he has risen, just as he said. Come and see the place where he lay. I am always impressed to hear how pastors retell the same old Bible stories in different ways and with different perspectives every year. The Christmas and Easter stories are the most widely known stories by Christians and non Christians alike. Today I was touched and impacted greatly by the Easter sermon. It has never occured to me that the stone was not removed so that Jesus could get out. It was removed so that everyone could see in and to eventually learn that He had risen! It wasn’t a magic trick. It was the resurrection! Mary surely didn’t believe at first that Jesus was alive again. Surely she doubted until she actually saw the risen Savior. We all would. Any normal person would think that His body was stolen until we saw Him in person! When she saw Jesus, she knew He was (and is) the risen Savior! What a glorious sight that must have been! What then shall we say of ourselves as Christians on Easter? Are we resurrected with Christ? Is that what people see? It never occurred to me really until today’s sermon that people don’t believe in the resurrection of Jesus Christ NOT because it’s so unbelievable but because they don’t see the resurrection in US . If you believe that Christ is your Savior who has rescued you from sin and slavery and death, your life should reflect that. But really, we so often do not reflect that we are Christians. If you know our Easter story from last year then you will be happy to know that this year’s is SOOOOO much better even than that! Our lives, our family, our marriage….all resurrected! My husband…resurrected! There are not many people in our lives that truly know what our family has been through, the hurt, the pain, the hatred, the ugliness that was our marriage and our lives. Those of you that do know and those of you that don’t, know this – God is most definitely alive and real and Jesus most definitely saved us! I know that He heals, that He changes, that He loves. And if He can do it for us, I know that He can for anyone. Here’s our Easter picture. 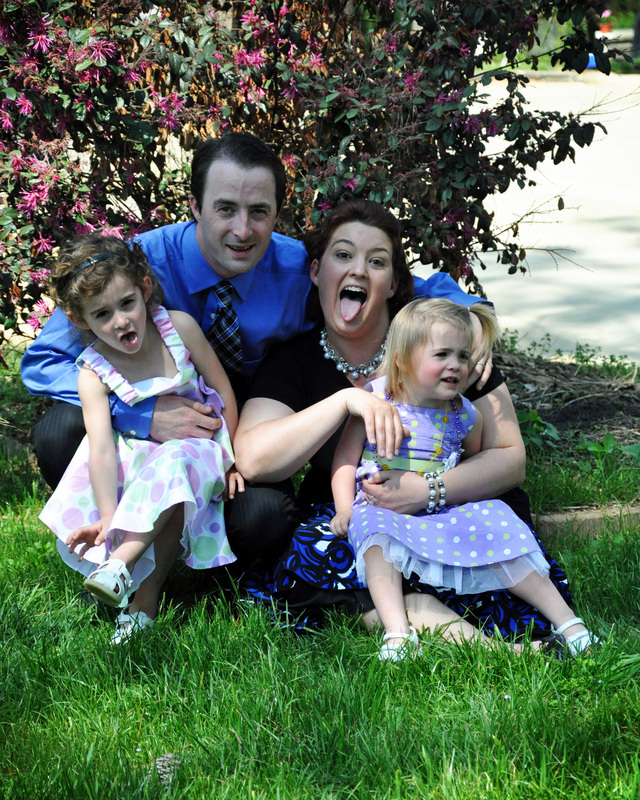 The girls just simply did not want to cooperate for photos today so I went ahead and posted our funniest one! Posted in Photgraphy, Reflection and tagged Christ, Easter, Family, Love, Resurrection. Bookmark the permalink. I forgot to post my fun family moments yesterday, so here are some of my random favorites so far this year! Posted in Uncategorized and tagged dog, Easter, Family, snow. Bookmark the permalink. I have to say that this Easter was the most memorable one for me so far! It’s filled with firsts. It’s the first Easter where my husband and I both are united completely and fully in Christ. It’s the first Easter my dad wasn’t here (no he’s not dead. He just went on a once in a lifetime trip with one of his buddies). It’s the first – and last – Easter that my husband was baptized!! It’s the first time my husband has ever spoken to a large amount of people about anything much less about his life previous to Christ and his salvation. It was fantastic! We had some sweet time with my mom at the home where I grew up, ate comfort food, and did the traditional Easter egg hunt with our two daughters. It was filled with familiar smells, voices, and laughter. Bloke got to watch the Masters golf tournament….probably for the first time since we’ve been married (almost eight years). When my husband was baptized, our family was resurrected as well. What was old is now new. What was lost is now found. Bloke’s heart was truly cleansed and he proclaimed to the world that he was saved by grace and crucified with Christ. I am so proud of him. With every passing day, the Lord is growing my love for my husband. He is changing my heart and my life. He is molding me in His image. He is saving me! 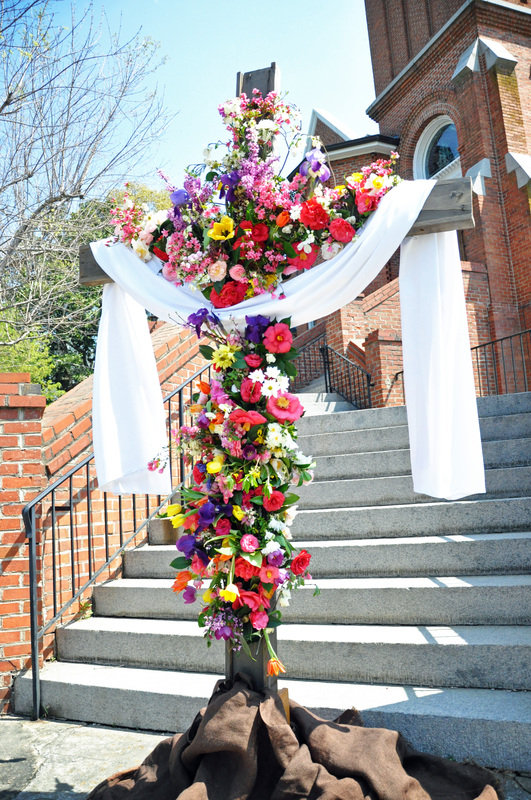 What a celebration this Easter was, and what a celebration it should be every day. Thank you Wesley for such wonderful pictures of Sam’s baptism!! You rock! Thank you, mom, for taking such a beautiful photo of our new family! Posted in Uncategorized and tagged Baptism, Easter, Family, Resurrection. Bookmark the permalink. I’ve Got a New Logo!